This authentic dish from Rajasthani cuisine is very delicious to eat and can be cooked at home. 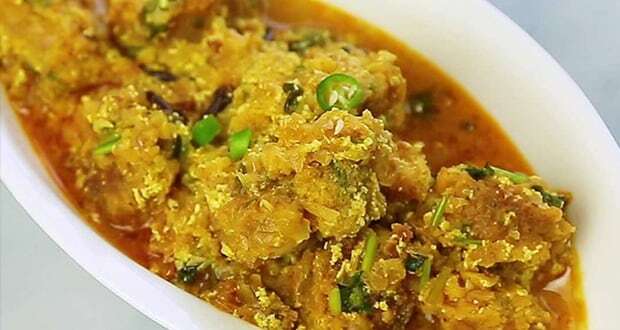 Gatte are basically cooked gram flour dumplings which are added to the spicy curd gravy. It can be served for lunch or dinner in usual days and at dinner parties at home as well. This mouthwatering delight is full of spices and flavors that you just can’t resist. 1.Mix besan, cumin seeds, turmeric powder, baking soda, red chilli powder, salt, and coriander powder in a large deep bowl. 2.Add mint leaves, chopped ginger and curd to it. Mix thoroughly. 3.Now gradually add required quantity of water and knead a soft dough. 4.Divide the dough into equal portions and roll each portion into long cylindrical shapes. 1.Boil water in a pan. When it comes to boil, add the cylindrical gattas in the boiling water. 2.Boil until they are fully cooked. Check by inserting a knife in the cylindrical rolls whether they have cooked properly. 3.Let them cool down for a few minutes and then cut into long pieces. 4.Now heat oil in a non- stick pan and shallow fry the gattas on medium flame till golden brown. 1.In a heavy bottomed pan heat oil and ghee. Add red chilli whole, cloves and cinnamon stick. Saute for 20-30 seconds. 2.Now add the chopped onions and cook until soft and translucent. 3.Add salt and turmeric powder. Saute well. 4.Now put garlic, red chilli powder, coriander powder, hing water and coriander leaves. Combine all the ingredients thoroughly. You can add more or less red chilli powder as per your taste. 5.Add curd and mix well. Cook until oil appears on the surface. 6.Put water in the mixture and bring it to boil over medium flame. When it becomes a semi-thick gravy add the fried gatte and cook further. 7.Stir with light hands and make sure that the gattas are well coated with gravy. 8.Garnish with green chillis and fresh coriander leaves. 9.Serve this Spicy Gatte ki sabzi with chapatis or rice.